The Korean government has pledged support for the development of rescue robotic technologies by setting a goal of commercialization by 2022. The Ministry of Trade, Industry and Energy (MOTIE) said Monday it is reviewing the “public safety robot project” to see if it is viable. The project will focus on developing core technologies related to the rescue robots. Once the project gets the green light, it will support development of various technologies including sensors that operate even in thick smoke, as well as crawler systems. These technologies will be used in disaster situations such as rescuing people under debris, detecting stranded people in smoke-filled buildings that are on fire, or surveillance of nuclear power plants. Related industries are expected to grow significantly. Citing a study by Homeland Security Search Corporation, the ministry said the world’s disaster rescue industry is expected to double from 372 trillion won ($338 billion) in 2013 to 612 trillion won in 2022. China alone is expected see its market expand from 57 trillion won to 140 trillion won during the same period. For full article, see Jongang Daily. The government plans to designate two cities where local and foreign companies developing businesses related to Internet of Things (IoT) technologies can test products and services and get consumer feedback. Under the plan, the central and regional governments will establish a fund to establish super-fast telecom networks and basic data transfer infrastructures. The cities will test smart health care devices and a digitized public administration system. The testing will last three years. The Ministry of Science, ICT and Future Planning (MSIP) announced Thursday it will allocate 12.6 billion won ($11.5 million) this year for the project, 7.5 billion won for the smart health care project and 5.1 billion for the smart public administration project. The ministry will begin accepting project applications from city governments today. The IoT test-bed project is part of the government’s effort to help private sector IT companies, and it will be a first step toward studying the impact of IoT devices on the legal system. For full article, see Joongang Daily. 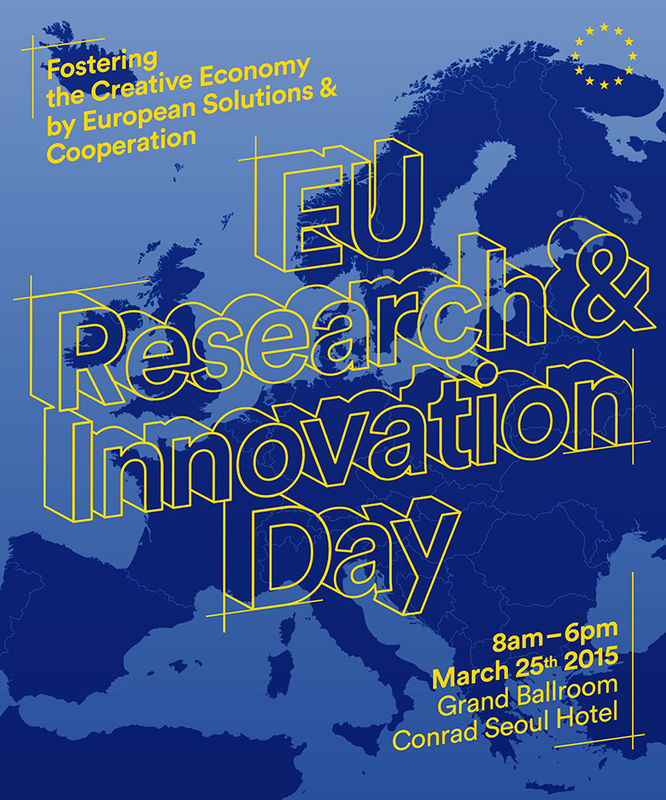 The Delegation of the European Union to the Republic of Korea and the European Chamber of Commerce in Korea are co-organising the 1st EU Research and Innovation Day in the Conrad Hotel, Seoul, Korea on 25 March, 2015. In this event, all EU Member States and their major research and innovation organisations will also participate and share information with Korean counterparts about their policies, programmes and success stories. There will be ample opportunities for networking with present and future partners. Please join our event and experience the excellence of European research and innovation! To create the creative economy ecosystem in Chungcheongbuk-do, LG will open 29,000 patents and raise a venture fund to the tune of KRW150 billion. Also, LG affiliates, including LG Chem, will invest KRW1,600 billion over a 3-year period to invigorate the local creative economy. The LG Group announced this plan at the launching ceremony for the Chungcheongbuk-do Creative Economy Innovation Center held at the Chungcheongbuk-do Knowledge Industry Promotion Agency in Ochang, Chungcheongbuk-do on February 4. 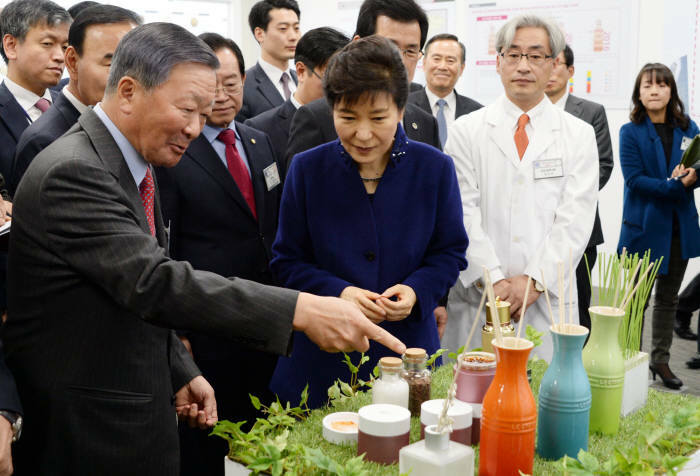 President Park Geun-hye, Lee Si-jong governor of Chungcheongbuk-do, Koo Bon-moo chairman of LG and the CEOs of over 140 local small and medium-sized venture firms were present at this ceremony. LG will install the ‘IP Support Zone’ which shares patents with local small and medium-sized venture firms. Here about 29,000 patents, including the 27,000 patents owned by LG and the 1,600 patents of 16 government-funded research institutions, will be opened for free or at minimal costs. Among them, 3,058 patents will be transferred to small and medium-sized venture firms free of charge. The patent areas include bio, beauty and energy, earmarked for the Chungcheongbuk-do area, as well as electronics, chemistry and communication. For full article, see Korea IT News. Samsung Electronics said Monday it has started mass producing the world’s first 14-nanometer mobile application processor. It hopes the latest chip technology will give the Korean tech giant a competitive edge over rivals such as U.S.-based Qualcomm. 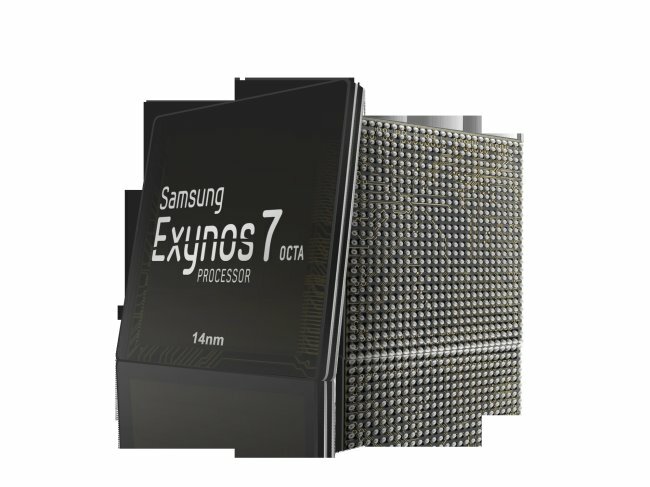 According to the company, Samsung’s new Exynos 7 Octa has 20 percent more processing power and spends 35 percent less electricity than 20-nanometer processors that have thus far been widely used in the mobile chip market. The latest chip technology also features a three-dimensional transistor design, known as the FinFET, unlike the conventional flat chip design, it added. For full article, see Korea Herald. A research team at the Korea Institute of Science and Technology showcases a prototype of a lunar rover, which will be used for moon exploration in 2020. On Feb. 16, a research team led by Dr. Gang Sung-cheol at the Korea Institute of Science and Technology (KIST) unveiled a prototype of a lunar rover, which is planned to be on the moon roving by 2020. What is notable is that a lunar rover has been developed with local technology. The machine is able to carry out its mission in extreme conditions. Since it is designed to control heat easily, it can operate in a huge daily temperature range from 170 degrees below zero to 130 degrees above zero. It can perform its tasks on rough terrain as well. 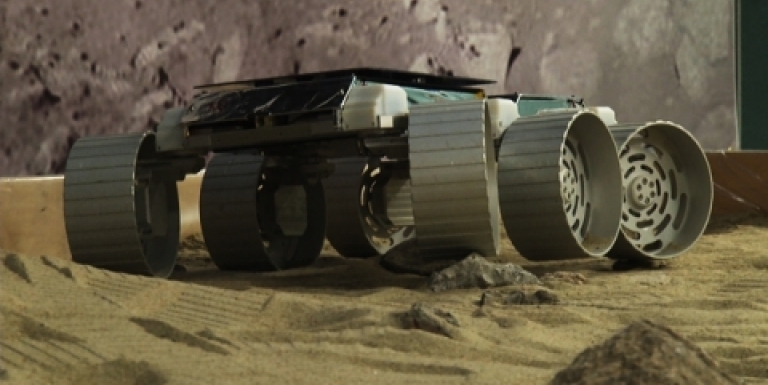 The most notable characteristic of the newly-developed rover is that it is composed of two bodies. 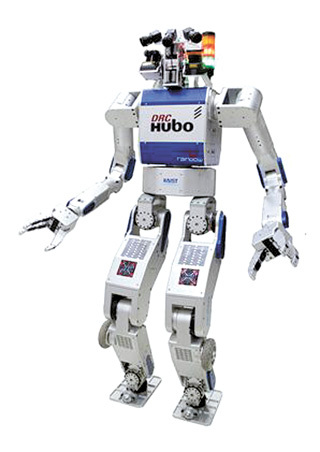 The passive double tracks of ROBHAZ, a robot designed to perform dangerous work, were used. The passive double tracks with two separate bodies connected with chains help the robot operate in a smooth manner, while maintaining its contact with the ground even in rugged terrain. The rover can move steadily up 30 degree slopes and even get over a 5-cm-tall fence. It can move up to 4 cm per second. For full article, see Business Korea. 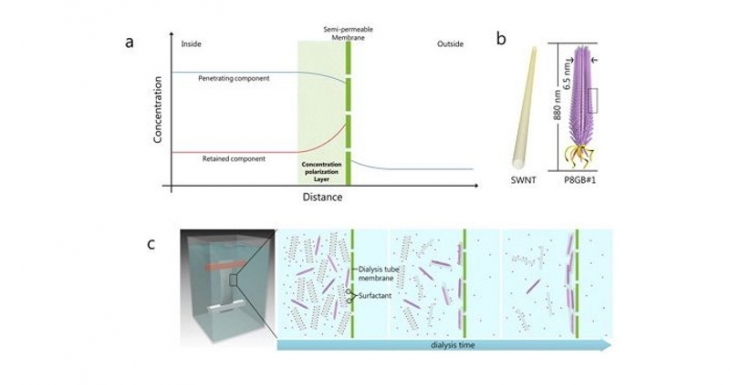 The principle of forming a conductive nanomesh and the material structure. Korean research team has successfully developed a technique to make a new material that can measure brainwaves without making an incision into a patient’s scalp. A research team headed by Dr. Lee Hyung-jung from the Korea Institute of Science and Technology (KIST) announced on Feb. 11 that they have succeeded in developing a new material with a mesh structure capable of detecting even weak biosignals when attached to a human skull. It was done by combining a single-layer carbon nanotube and a substance that the team calls P8GB#1. Biosignals from a brain, a heart, and muscles are usually delivered in the form of ions. It is possible to get various kinds of information by changing ion signals into electronic signals and analyzing the result using electronic devices. The research team discovered P8GB#1, a substance with a tendency to stick to single-layer carbon nanotubes, producing a highly-conductive nanomesh. The material with a minute mesh structure can detect electronic signals owing to the large contact surface. 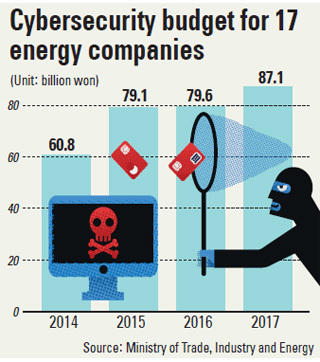 The Ministry of Trade, Industry and Energy (MOTIE) says state-run power companies will spend a total of 79 billion won ($71 million) on cybersecurity this year, an increase of 18 billion won. Minister Yoon Sang-jick on Thursday afternoon met with CEOs of 17 state-run energy companies, including the Korea Electric Power Corporation (Kepco), Korea Hydro and Nuclear Power Corporation (KHNP) and Korea Power Exchange. Kepco, the nation’s sole power distributor, will get 28.4 billion won and KHNP 11.5 billion won. Each of the other companies will receive up to 4 billion won. The budget will be mostly spent on hiring security experts, maintaining internal network infrastructure and expanding maintenance teams. All 17 power companies will have to structure their internal network in five systems, from the current three. The current system is broken down into a regular network that can access the Internet, an intranet that mainly deals with document processing, and an exclusive network to control the power plant. From now on, the intranet will have an additional system for confidential technical documents like power plant blueprints. The power plant control system will also be split into two networks to beef up security. 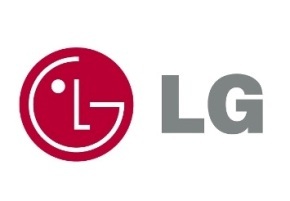 LG Display Co., a global panel maker, plans to spend an additional 1 trillion won (US$915 million) this year on its large-sized organic light-emitting diode (OLED) panel production line in South Korea to meet growing demand, industry sources said Wednesday. LG Display has already spent 800 billion won on the OLED panel production line, which produces panels for TVs, the sources said. LG Display is told to have commenced production at the production line starting November 2014, but the detailed capacity has not yet been revealed. The company aims to expand its monthly production of the eighth-generation OLED input sheets to 26,000 units at the line in Paju, just west of Seoul. When combined with its existing line, LG Display’s combined monthly production of OLED input sheets will reach 34,000 units, the sources said. LG earlier said it will target the high-end TV market on the back of 77, 65 and 55-inch Ultra OLED models. The OLED technology, more advanced than LCD since it produces light without the backlight unit (BLU), is seen as the company’s future growth engine. For full article, see Yonhap News. Samsung Electronics has established a team to work on hi-tech innovative business projects, officials said Monday. Its core mission includes projects on virtual reality, robotic telepresence, drones and robots, three-dimensional (3D) printing and unmanned vehicles.”The team will explore how technologies could help people’s daily life for a better future,” an official said. Samsung mobile chief Shin Jong-kyun will lead the team inside the mobile division. The team, which has no direct links with the company structure and divisions, will operate independently. “Given the significance of the team, members will have more authority and independence because the main purpose of the team isn’t to develop single devices for any imminent results, but to develop solutions to go with Samsung’s manufacturing capabilities,” the official said. For full article, see Korea Times.